Fifth Avenue's St. Thomas's Church at 53rd Street was the scene of the impressive funeral of Deputy Fire Chief Charles W. Kruger on February 16, 1908. An estimated 25,000 persons crowded the avenue, extending as far as Columbus Circle. The beloved firefighter had died in a Canal Street fire a few days earlier, drowning in the water-filled sub-cellar after the floor gave way. The Elmira, New York newspaper, The Summary, reported "Bishop Henry C. Potter put aside the custom of the Church in refraining from eulogies during services for the dead, and in an address from the pulpit advocated the building of a monument to the memory of the man who was known by the fire fighters under him as "Big-Hearted Charley." Potter said, in part, "Shall the honor we are paying his memory here end with this service? New York is adorned with monuments to soldiers and statesmen, and it should have a monument to typify the splendid heroism of this department." Within one week of the funeral a committee had been formed to manage "the Kruger and Firemen's Memorial Fund." On February 24 The New York Times reported "It is the purpose of the committee not only to erect a memorial to Deputy Chief Kruger and other firemen who have lost their lives in the performance of their duty, but to raise a fund large enough to provide for the care of such firemen's widows and the education of the children, supplementing the pension fund of the Fire Department." Bishop Potter was appointed chairman of the committee. Public response was overwhelming. On February 27 the committee received a $1,000 check from J. P. Morgan--a significant donation equaling about $27,000 today. The gift may have produced a bit of peer pressure, for on March 17 John D. Rockefeller sent his $1,000 check, followed by Andrew Carnegie's identical amount six days later. Benefit events included the gala performance at the Metropolitan Opera House in April. Celebrities donated their services for the star-studded evening. Patrons paid between $1 and $3 for seats to see acts by George M. Cohan, Eddie Foy, Joe Weber and his company, Otis Skinner and his players, Anna Held and others. Music was provided by the combined orchestras of the New Amsterdam, New York, and Liberty Theatres. W. H. Crane, the composer of The Merry Widow, presented an act from that play. And so did Joe Weber. The Times noted "The particular novelty of the bill will be the entire second act of "The Merry Widow," followed by Joe Weber's company in their burlesque of the same act. It is claimed that this will be the first time in New York that an act of a popular success and a burlesque of it have been presented on the same stage and in the same bill." The benefit brought in an additional $12,000 for the fund. Bishop Potter died three months later, on July 21. His post as chairman of the memorial committee was taken by Isidor Straus, a founder of Macy's department store. The questions of what form the monument would take and where it would be placed were seriously considered. One group wanted a dramatic "huge statue of a fireman with a rescued baby swung aloft in one hand and a fainting woman tucked under the other arm," according to the New-York Tribune on January 9, 1910. But, the article said, that idea "at last yielded to those who believed that something lower in tone and more classic in design would have a more permanent value." The committee chose architect H. Van Buren Magonigle and sculptor Attillio Piccirilli to design the monument. The pair was currently at work on another project, the imposing Maine Memorial to be placed at the southwest entrance to Central Park. Magonigle had recently designed the William McKinley Memorial in Canton, Ohio. Piccirilli was one of the six Piccirrilli Brothers, responsible for monumental sculptures like the later New York Public Library lions. Magonigle told reporters "The monument proper is in the form of a votive tablet about 25 feet long, 22 feet high and 8 feet thick, flanked by two statues symbolical of Duty and Sacrifice." An 18-foot long bronze tablet would feature a bas relief of "a dash to a fire and the elements of a scene familiar to every New Yorker." Below it would be an "ample bowl of running water for horses." The artist had chosen Knoxville marble for the material. The Tribune noted its "warm slightly pink tone" had "been a factor in making Mr. Morgan's library in 36th street one of New York's chief delights." Piccirilli's grouping of Duty would depict a "woman with a dead fireman lying across her knees," and Sacrifice would be represented by "a fireman's widow reciting to her child the story of his father's death." As he did for the Maine Memorial, Piccirilli chose the highly-popular model Audrey Munson to pose for both women. When the Parks Department announced the site for the Firemen's Memorial in January 1910--the northern end of Union Square--the fire department balked. On April 9, 1910 Chief Croker told reporters he "could not think of a site in Manhattan less suitable," and one reporter added "it is said he speaks for practically every man in the department." 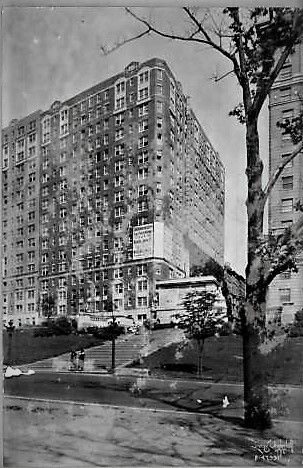 The New York Times noted "If a Riverside Drive site is chosen, it is his idea to have the memorial placed at the foot of one of the streets, as the Sigel and Soldiers' and Sailors' monuments are situated." The Parks Commissioners and the memorial committee listened. At the November 27, 1910 committee meeting it was announced that Magonigle's plans and specifications were competed as were Attilio Piccirilli's sketches, and the Board of Estimate and Apportionment had appropriated $40,000 to add to the fund (bringing the total raised to date to nearly $100,000). And a new site in Riverside Park at 100th Street above Riverside Drive had been approved. The New-York Tribune reported the following day "It is expected that the first sod will be turned some day this week." If a visitor was not overly impressed with the Property Road side of the memorial, he would be dazzled by the Riverside Drive elevation. A grand, wide staircase from the Drive rose to a balustraded plaza. Although Magonigle's fountain and pool could no longer be used as intended--to quench the thirst of weary horses--it provided a dramatic and beautiful element to the design. Sacrifice was represented by a widowed mother and her child. Piccirilli placed a fire hydrant by her side. The completed monument cost $90,500 (more than $2.3 million today), and while millionaires and the city had provided around half that amount, common New Yorkers had donated unselfishly. To represent Duty, the sculptor depicted a grieving woman with a deceased firefighter across her lap. The New-York Tribune noted on January 9, 1910 that most of the $52,000 in public donations was "contributed in small sums. Twenty-five and 50-cent pieces were common offerings, and these often came from 'Johnny's bank' and 'Little Mary's candy money.' Many children in Harlem got up fairs to raise dollars." The unveiling of the memorial came on September 5, 1913 during the Convention of the International Association of Fire Engineers. The ceremonies began with a parade of 1,500 regular firemen and 2,000 volunteers who marched up Fifth Avenue, starting from 57th Street. Forty pieces of fire apparatus were in the parade, viewed by thousands of persons along the three-mile route. The Sun reported that 1,200 fire chiefs from all parts of the world (in town for the convention) were among the 4,000 dignitaries in the viewing stands. Noticeably absent was the committee chairman, Isidore Straus. He and his wife, Ida, had died on the RMS. Titanic in April 1912. The unveiling was emotional and dramatic. The Sun reported "Ten thousand persons stood with uncovered heads while four little girls, daughters of firemen who lost their lives fighting the flames, pulled aside the American flags veiling the monument as the band played 'The Star Spangled Banner.' Fifty-three other girls, whose fathers died in fires, assisted as the ceremony. All were dressed in white and wore bouquets of roses donated by the Park Department." The Firemen's Memorial became the site of the Fire Department's annual October memorial services. But in 1917 they ceased due to the department's resources being spread thin when so many firefighters left to fight the war overseas. They did not resume until 1920. The dangers and sacrifice required by the job were evidenced in the October 5, 1935 services at the memorial. Both Mayor Fiorello La Guardia and Fire Commissioner McElligott spoke to the nearly 2,000 firefighters assembled that day. The Times mentioned that "During the past year eight firemen have died in the line of duty." Like all Manhattan monuments and public artwork, the Firemen's Memorial suffered abuse. In the winter of 1935 youngsters sledding down the hill used the bowl of the fountain to built a fire to warm themselves. The New York Times reported on the subsequent damage on August 23, 1936, saying "stone difficult to match was cracked and destroyed." The damage sparked a conservation of the monument sponsored by the Work Progress Administration. Piccirilli's bas relief of galloping steeds pulling a fire truck to a blaze was a scene "familiar to every New Yorker." By mid-century vandals were harvesting bronze from public artworks for scrap. A bronze plaque had been pried off the Soldiers' and Sailor's monument several years earlier, and in the early 1950s Piccirilli's stunning tablet of the galloping fire truck was stolen. The tablet seen today is a replica cast in the 1950s. Perhaps even more audacious was the theft of the bronze lamp posts that flanked the base of the staircase. They were first noticed missing in 1974. John Tauranac, writing in New York Magazine on November 15 1976 mentioned the lost lamp posts and complained "These dodgers are stealing us blind. And they are not just stealing second base, they are robbing us of some decent urban amenities and our heritage." Tauranac placed the scrap value of bronze at the time at about 35 cents a pound. By the early 1990s the monument itself was in disrepair. Not only had the fountain not flowed in decades, there were severe structural problems. On February 24, 1991 The Times reported "Water had seeped between the marble and the brick foundation, causing the stone to bulge and shift." Park Administrator Charles McKinney deemed it "the most deteriorated monument in Riverside Park." An $2 million city-funded restoration was initiated in 1991, headed by architect Richard Pieper. During the dismantling of the monument, a copper box was discovered within the foundation. The Times reported that it contained "letters from the architect, as well as the badge and firebox key of the city fire chief who saw his deputy die in 1908 in a fire on Canal Street that inspired the monument." Water once again flows into the basin. The restoration of the monument was completed before the most tragic and poignant day in Fire Department history. On September 11, 2001 the Fire Department lost 343 firefighters in the terrorist attack on the World Trade Center--the worst loss of life ever in a single day for the department. The Firemen's Memorial became a shrine for the lost heroes and for weeks it was the site of vigils. A moving and well-deserved monument. The action and sense of urgency in the bas relief is stunning! Thank you.